RollerCoaster Tycoon 2 Game Review - Download and Play Free Version! Create Your Very Own Amusement Parks With This Excellent Simulation! Build Roller Coasters and Other Awesome Rides! It's time for your crash course in business management and roller coaster design 101! With Roller Coaster Tycoon 2, you're the boss, so build and manage the theme park of your dreams complete with almost any ride you could possibly think of. Tons of options, many improvements over the first game - Roller Coaster Tycoon 2 is one of the best simulation games out there! It's not all fun and games, though: to watch your park grow and thrive, you need to pay attention to your finances as well as the desires of your customers. If you can juggle it all and make money, you can become a Roller Coaster Tycoon! 26 Challenging Scenarios to Test Your Skills! Attract 1,500 guests, earn $10,000 a month, build 10 huge coasters - there are lots of goals to achieve. The 26 scenarios are broken down into 5 categories: Beginner Parks, Challenging Parks, Expert Parks, "Real" Parks, and Other Parks, and you can play any scenario at any time. You don't have to start with the easiest one! Roller Coaster Tycoon 2 is officially licensed by Six Flags, and it includes some of the most famous amusement parks around. Manage Six Flags Magic Mountain, Six Flags Great Adventure, Six Flags over Texas, and more! Coasters, Amenities, and Rides, Oh My - You Control Everything! If you build it, they will come! Dozens of roller coasters; other rides like ferris wheels, bumper cars, and water attractions; food and drink stands; fountains, landscaping, and gardens - it's up to you to find the best balance between all of these and more. Hire handymen and entertainers, design footpaths, adjust prices - the list of fun things to do in Roller Coaster Tycoon 2 goes on and on! Bring the most customers to your park by spending your money wisely and finding just the right mix of everything. 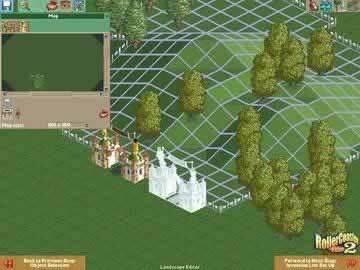 This particular RollerCoaster Tycoon 2 download includes a Scenario Editor which lets you design and build your own scenarios completely from scratch! Got a great idea for a roller coaster? It's also got a Roller Coaster Designer so you can put that idea into action. A Track Designs Manager lets you name or rename any roller coaster. There are a bunch ways to customize your experience, and with so many options, Roller Coaster Tycoon 2 offers great replay value! Lots to Like for Aspiring Tycoons of All Ages! With Roller Coaster Tycoon 2, the hustle and bustle of your growing park means there's always something interesting to look at. The rides and the guests are animated in 3D, and the musical selection is varied and entertaining. Kids enjoy the visuals and hilarious sound effects! Overall, Roller Coaster Tycoon 2 is a game that has something to appeal to everyone. New players can get their careers started, while seasoned coaster builders appreciate the depth of gameplay. Placing the right mix of thrill rides, rollercoasters, and gentle attractions to meet all the needs of your park guests. Designing your own custom rollercoasters for maximum thrill and profit! Adding scenery, landscaping, gardens, theme props, fountains, and other extras to create the most fascinating ambience and park environment. Creating the best footpaths and trails for maximum traffic management throughout the park. Organizing your handymen to efficiently clean up after guests, mow lawns, and water gardens to keep visitor satisfaction high. Landcaping the park to make way for more attractions to bring more guests and improve the value of your park. Adjusting prices of rides, food & drink stalls, souvenir stands, and admission prices for greatest profit and visitor satisfaction. Designing your own rollercoaster thrill rides for your park! Building six real life Six Flags Theme Parks! Getting tons of game replay value as you can build as many different parks as you want! Sound Like a Blast? It Is! What are you waiting for? Download Rollercoaster Tycoon 2 and experience the fun and educational benefit hundreds of thousands of people have already discovered! Unlike other sites, our Roller Coaster Tycoon free download contains no ads, spyware, malware, or additional bundled software you don't really want so you can download and play our version with confidence! 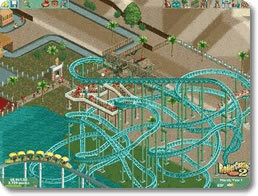 RollerCoaster Tycoon 2 is a detailed and in-depth simulation game that puts you in control of your very own theme park. You are in total control and decide what rides are built, how much to charge for admission, who to hire, and more. You build your park from scratch as you see fit and work hard to attract more guests and make more money. You can even design your own coasters or build real Six Flags roller coasters. 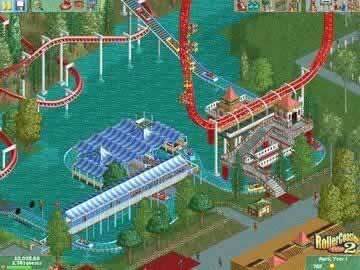 You start RollerCoaster Tycoon 2 by selecting one of twenty-six theme park scenarios. Each scenario has a different location and objectives. Some scenarios place you in control of a castle or factory that you must turn into a popular and profitable theme park. Other scenarios may place you in control of real-life Six Flags theme parks. Possible objectives include having a certain number of guests in your park within a few years time, having a certain park rating, or even earning a certain income per month. Once you've selected your scenario, you'll be handed a theme park and $10,000. You must use this money to build attractions and amenities that will draw as many people to your park as possible. You have a huge array of options and choices in how you want to build your park. You can build rides that have already been designed for you or build your own from scratch. You can choose which food and drink stands you want to build. You make decisions on hiring staff such as a handyman to keep the park clean, or a mechanic to keep your rides running. You decide the prices and admission fees that fund your park. You even have control over the landscaping within your park. There are endless possibilities when it comes to creating an amazing theme park. The various scenarios in RollerCoaster Tycoon 2 are split up into several difficulty levels that are all available at the start of the game. This lets you choose a difficult that's right for you, while still giving you some choice on the park you'll start with. If you're a more experiencing simulation player or played the first RollerCoaster Tycoon, you can skip right to the more challenging scenarios. Similarly, less-skilled players or those new to the series can start with easier parks. There are also several tutorials provided to introduce players to the game and the basics of building a successful park. While the tutorials are quite useful and a requirement to anyone new to the game, they also only deal with the basics. To figure out the more advanced or difficult elements you'll need to experiment with your parks. The controls in RollerCoaster Tycoon 2 are fairly simple. Objects are selected and placed with the mouse, while you can move your view around the park with the arrow keys. All of the buttons you use in building your park are labeled as well. It might be a bit difficult to learn these on your own or through experimentation, but the tutorials do a good job of covering what the buttons do (such as rotating the camera or building a ride). The biggest issue with the controls is the limited camera angles. You can only view your park from four directions, which can make seeing/building things like walkways in your park more difficult than it should be. While RollerCoaster Tycoon 2's graphics are somewhat old, they are also very detailed. You can see individual people as they traverse your park, a roller coaster on its track, or even litter on the walkways and paths of your park. These small details add a great touch to the game and improve on the simulation. The sounds also play into the simulation nature of the game, as you can select the music played for each ride that adds to that ride's theme. You'll be able to hear the music you pick for a ride every time you click on it. They won't blow you away, but the graphics and sounds work very well with the game. The variety of scenarios as well as the ability to custom build your parks and rides means that this game will last a long time, but also gives you a reason to replay scenarios multiple times. Each park provides unique challenges and locations to tackle. Even if you do the same scenario several times, you can create a completely different theme park each time. The biggest issue with playing through the scenarios is the time investment required. It takes a long time to get through one scenario, and there is no way to speed up the game if you meet your objectives early or want to fast-forward to the point when you've earned enough money for more rides. Additionally, you're limited to the twenty-six scenarios when it comes to creating parks. It would have been great it there was an option to create a park with unlimited money and no restrictions or objectives. Overall, RollerCoaster Tycoon 2 is an excellent and detailed simulation game. Fans of the RollerCoaster Tycoon series and simulation games will not be disappointed. The game is also a great choice for players who may not be as familiar with the series or genre. You control every aspect of your park in one of twenty-six unique and interesting scenarios. Work with real-life parks and rides or build custom parks and rides from scratch. A few minor issues pale in comparison to all that this game has to offer. RollerCoaster Tycoon 2 will provides hours upon hours of entertainment. See how you can build your own theme park with awesome rides!